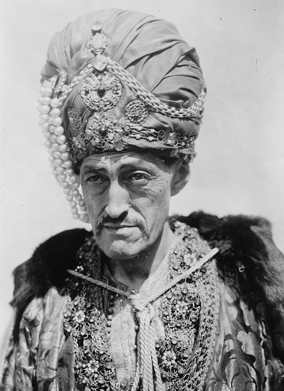 Sadakichi Hartmann as the Mongol Prince’s court magician in The Thief of Bagdad, 1924. Courtesy of the Library of Congress Prints and Photographs Division. At the far edge of his adopted country, Sadakichi had been within an ocean’s reach of the completed circle of his life, the twinkling lights of Japan, his birthplace, seemingly visible just beyond the Pacific Coast Highway. He had tried to make the leap back home just once, more than forty years before, in one of the most fateful and humiliating performances of his life. For years, he had in his mind a scent—no, less than that, an idea of a scent—a gentle puff, released into the cool night air. It would melt continents, allowing him to cross vast oceans like a fast skull across a glassy lake. He called this scent his “perfume concert,” the most purely aesthetic experience of his self-proclaimed aesthetic life. And it would deliver him home. If beauty was difficult, then by god Sadakichi Hartmann would make his entire life beautiful—he would wallow in its difficulty. Carl Sadakichi Hartmann, son of Oscar Hartmann of Hamburg and Osada Hartmann of Nagasaki, was born around 1869* on the small island of Dejima, the only slice of soil in Nagasaki where foreigners were welcome. Before the Meiji Restoration, Japan was still, for the most part, closed to the West and to Westerners. Women of the merchant class were allowed to work on the island, some taking positions with foreign officials, first as servants and often later as mistresses. One of these women was Osada, Sadakichi’s mother, who married Oscar Hartmann, a German official, and quickly had two sons. His young mother died when Sadakichi was less than a year old, and the boy became obsessed with the vision of this unknown woman. He would tell fantastical tales about her, claiming she had been refused burial in Nagasaki because of her foreign marriage, and that her body was carried over six hundred miles to Kobe to be cremated. This was probably not true. In 1868, cremation was not common in Japan, and the transportation of a body over such a distance would have been almost impossible. Osada was probably buried where she died. With his wife gone, there was little to keep Oscar Hartmann in Nagasaki, and he decided that he would raise his two sons in Germany. At the age of four, Sadakichi would leave Japan, never to return. The year “Madame Butterfly” was published as a short story in Century Magazine, Sadakichi was thirty years old, having lived in America longer than he had lived in any other country. The story itself was derived from a French novel, Madame Chrysanthème, by Pierre Loti, which was itself based on events that may or may not have happened among the naval officers of Nagasaki. The Puccini opera wouldn’t have its New York premiere until 1906, and by then the story’s main characters were almost mythical, the Adam and Eve of Japonisme. Sadakichi would often refer to himself as the son of Madame Butterfly, an innocent haunted by a tragedy he could not set right. (It was a comparison John Barrymore had clearly tired of when the actor called Sadakichi a “living freak.”) But if there was anyone in this story Sadakichi resembled in his turbulent life, it was the devilish, practical Pinkerton, smelling of whiskey, intoxicated by his Japanese ghost. He enters upon our stage with the declaration that the love of the world is for the taking; he raises a glass to his American future. If literature was the passport into this new kind of modern society, Walt Whitman was the common language, and the home of Whitman is where, around the age of sixteen, this lanky, German Japanese boy with a dark suit and a pince-nez began his American pilgrimage into the dark heart of bohemia. —While how little the New, after all—how much the Old, Old World! A new kind of intellectual immigration had begun to fill the low-rent apartments, all-night cafés, and empty storefronts of turn-of-the-century New York, one that shared as much with the newly arrived Russian Jews, Germans, and Irish of the tenements as it did with bored housewives from Portland, Maine, and college graduates from Davenport, Iowa. Unlike the sharp fold in the corner of a calling card on Fifth Avenue, there was a special form of introduction into New York’s bohemian life: a book tucked under the arm, a poem copied for a friend. Shared enthusiasm for Tolstoy might make a new Russian acquaintance at a meeting for the Industrial Workers of the World, or a few lines of Shelley could soften the heart of a hardheaded anarchist. But it was a common love of the man who contained multitudes, the proto-bohemian Walt Whitman, that seemed to be the hothouse that contained all of these blooming personalities. By seeking out Whitman first, above all others, Sadakichi shrewdly positioned himself as both a reader and someone to be read about. He felt he belonged in the pantheon of Whitman’s faces from Leaves of Grass (“The pure, extravagant, yearning, questioning artist’s face”). It was a privileged realm of characters that Sadakichi cast on and off like a parade of masks throughout his life, even to the very end (“The ugly face of some beautiful Soul, the handsome detested or despised face”). Work, or rather, employment, was not something that much interested Sadakichi Hartmann. After traveling to Paris and meeting symbolist poet Stéphane Mallarmé (and getting fired from a magazine job), Sadakichi, at twenty-three, published Christ: A Dramatic Poem in Three Acts, described by Publishers’ Weekly as a “sensual and almost blasphemous drama.” The play was immediately banned, copies were publicly burned by the New England Society for the Suppression of Vice, and Sadakichi was arrested, spending his Christmas in jail. By his mid-twenties he’d lost a job with architect Stanford White after suggesting his buildings might be “improved upon only by pigeons.” He made a meager living writing two columns a week for the New Yorker Staats-Zeitung, a German-language newspaper that was the third largest daily in the city. He wrote about actors, tramps, and painters—those on the artistic and social fringes of New York life. (Writers somehow always ended up on the top of the social heap.) He signed his columns with pseudonyms: Caliban, Hogarth, Chrysanthemum; the trickster, the satirist, the emblem of Japan. His writing sometimes angered his friends, including his mentor, Whitman, but he also championed new artists such as Thomas Eakins and Alfred Stieglitz. Sadakichi had had a prodigious career in New York as the poet-king of a small group of intellectuals in Greenwich Village. A 1916 article proclaimed him the “weirdest figure of American letters…He is Baudelaire, Gérard de Nerval, Verlaine… he is a poet, artist, author, critic, lecturer and professional esthete.” He was a flaneur long after the age of flaneurs had ended, and most people didn’t quite know what to make of him. If the writing of the time was meant to agitate, then Sadakichi was a soft-hearted bull, more interested in sniffing flowers than charging red capes. Everyone involved in this newly modern life was searching for a way to live, a model to live by, a maxim to live for. Individual energies were envied among these “creatures of self-amplification,” as historian Christine Stansell described the bohemian in her book American Moderns: Bohemian New York and the Creation of a New Century. It wasn’t enough to make art; artists had to live a life of constant inspiration, to themselves and to their friends, bound together by an endless circle of reading, writing, and publishing. The bread and butter of Greenwich Village life was the word: it was a vocation, an evocation. Writing was the transformative medium, the call to arms for feminists, communists, and anarchists—all other art forms were superfluous. Sadakichi had more in common with the decadent hero of Joris-Karl Huysmans’s 1884 novel, Against Nature, about a dilettante who turned meditative loafing into an art. His hero dreamed of different ceiling treatments for his rooms and of embellishing a pet tortoise with jewels, all within the suffocating confines of his country home. Unmoored from family, nation, creed, and custom, Sadakichi wanted to live beyond the world of dreary causes, in a dreamy—if a little fussy—corner of his very own. In his criticism, Sadakichi wrote of beauty, of poetry, interested in teacups and vases, in actors and their greasepaint, in sweet smells mixed with sweat. The essential quality of bohemian life was dissatisfaction, a paranoia that everyone else was truly living. Ezra Pound wrote, “If one hadn’t been oneself, it would have been worthwhile to have been Sadakichi.” Like those who “burned with hot fire,” the savage desire for life, and the jealousy among those who were truly living, led to a slow self-immolation of one of the era’s brightest minds. The turn of the twentieth century saw a flurry of sense experimentation. The color organ was patented in 1895, an instrument with colored panels that lit up and changed in time to music. A few years later, one of the first electric organs, the Telharmonium, would have its debut in a specially built concert hall in New York. Music had been mechanized, canned, and zipped along wires—there was no reason to believe it couldn’t be aerated as well. But no one had ever heard of a perfume concert. It was an invention so faddish the newspapers had inked themselves in excitement and still managed indifference by the second column. “All lovers of good smells are expected to patronize the concert,” one hopeful feature began. However, “It may be that after a time the olfactory nerve of the New York gatherings will become jaded, and will require smells of more and more pungency.” It was suggested Mr. Hartmann take a trip to Brooklyn’s Gowanus Canal. Over the months of planning, Sadakichi had been uncharacteristically quiet about the performance. He had booked the theater and told a few friends, who helped him gauge the forcefulness of the perfumes he intended to use. This left the public imagination to wonder: would there be violins stuffed with roses? Rhythms drummed out with two brittle sticks of cinnamon? What would the music smell like, or, rather, how would the smells sound? When Sadakichi Hartmann shuffled onto the bare stage of the New York Theatre with two heavily powdered women trailing behind, he still had the long and narrow face of his youth with an expressive, wide mouth. But there was something finalized about his features now, like a retired Kabuki actor still wedded to his makeup. Visibly Japanese, and clad in an immaculate shirtfront—on which was pinned his emblem, a huge yellow chrysanthemum—he appeared shy and flustered. His two geisha assistants appeared uneasy as well. The audience had expected an instrument that was at once orchestra and ocean liner. Something big and electrical and gleaming gold, with bells and whistles, tiny little switches and a mahogany seat, in which this man would sit and fiddle with ivory knobs until each person smelled his concert of perfumes and was transported over land and sea to the lavender fields of France, the shores of the Aegean, and beyond. But there was no orchestra on the stage, not even a single instrument, just two girls in heavy makeup and kimonos, standing next to a pair of electric fans and two boxes of perfume-soaked linen. “The first odor is that of roses given us as the steamer leaves the wharf.” Sadakichi motioned toward the geishas, who slid the linen in front of the fan as if it were a magic-lantern show. A soft horn tooted from the orchestra to clarify the steamer’s presence. In the space of a minute, the auditorium filled with the undeniable smell of roses, which snuffed out the “smoking-car smell” that had long been a feature of that theater, and killed the scent from the musty garments of the women sitting in the upper boxes. Neuroscientists have since given a name to this condition: the Proust effect. The Frenchman’s three-volume-long bite into a tea-soaked madeleine set off a number of inquiries into the link between smell and memory. In the brain, the olfactory bulb nudges close to memory-related structures, and scientists have determined that the olfactory components of an experience are often the longest-lasting impression of an event—sights, sounds, and tactile sensations all die a quick death. The smells most remembered are those that are particularly vivid, emotional, or old. It was only natural that an artist like Sadakichi, who grew up in the culture of the Gesamtkuntswerk—the “complete work of art”—would want to create and experience where the elements of art and life might fuse. A concert of smells, carefully orchestrated, might be able to link those forgotten memories so that one might, in essence, relive a lost time. At the time it was considered little more than a parlor trick that smells could conjure up a feeling or memory. Newspapers suggested that the perfume concert might open an entire industry of memory aids. MANUFACTURE OF ANTI-HOMESICK SCENTS TO FOLLOW DEVELOPMENT OF NEW YORK FAD, read one headline in the Chicago Daily; the article explained that city dwellers traveling abroad might bring along odor capsules, so that when faced with boredom in Paris or Rome they need only open a package marked “Stockyards Extra-Strength” to be instantly transported home. In 1906, a movie theater in Pennsylvania hoped to increase interest in its newsreel of the Rose Parade by fanning the room with rose oil, to the complaints of everyone in attendance. A 1960 movie called Scent of Mystery was the only film ever to use a failed invention called “Smell-O-Vision,” a patented system of odors cued to the actions on-screen. At Disneyland’s California Adventure theme park, opened nearly a hundred years after Sadakichi’s performance, a gentle smell of citrus is spritzed on visitors during a ride where they seemingly soar over a grove of orange trees. The “apparatus,” an electric fan, was now blowing over the audience a sickly strong perfume of roses, which spread quickly across the orchestra, rising into the balcony seats. One man shouted that he “did not like the smell of the scuppers and there were too many aboard who were seasick.” Sadakichi responded that they were now arriving in England and were smelling the native wild rose. Another voice shouted that the creeping odor reminded him of the time the gas meter leaked. The audience had begun to turn. “Now we reach Germany,” Sadakichi continued. The girls slid in a second square of linen, and after another long minute the distinct odor of violets was blown from the stage into the balconies. “Who does not remember plucking violets on a fair morning along the banks of the Rhine?” Sadakichi asked. “The violet is Germany’s flower.” But no one in the theater remembered plucking violets. Violets were soaps and cheap toilet water, saltwater taffy and last night’s whore. Roses were women in fox fur and fake hair, or husbands begging for forgiveness. The perfumes that Sadakichi assumed would carve out the landscapes of provincial Europe had little or no effect on his audience. The nostalgia was his and his alone. He had not meant only to create, or only to find, but to bring, perhaps from afar, what he had already found, to give it his own identity. When the doors to the theater opened, the perfumes rushed out into the night air. The snow began to fall that night, covering the city in a thick musk of white. And everything was forgotten except for the snow; all the shapes of the city became snow, the taste of the air became snow, nothing was known that was not soft and quiet and still. By 1916, Sadakichi had spun out the frayed yarn of his youth in the East. He had married briefly but prolifically, siring five children with his wife, and one out of wedlock in an affair. His next companion remained his common-law wife, with whom he had seven more children. Like Pinkerton in Madame Butterfly, he seemed to join himself with women in the “Japanese fashion… Tied for nine-hundred and ninety-nine years. / Free, though, to annul the marriage monthly,” never heeding the warning of Sharpless, Pinkerton’s friend: “That’s an easy-going gospel / which makes life very pleasant / but is fatal in the end.” And like Pinkerton, he abandoned nearly all of them. Sadakichi headed west, first to found a theater company in San Francisco, later to Los Angeles, where he befriended the well-connected John Barrymore in much the same way he had sought out Walt Whitman years before. In Hollywood he became known to actors, producers, and directors as the sad clown of Barrymore’s circle. It was hard to imagine that the middle-aged Sadakichi Hartmann had ever been young and matinee-idol handsome, like the men and women he entertained in Hollywood. He grew his hair long and wore oversize clothes, embracing himself as a grotesque. His calling card featured an image of a long-limbed man in a black coat and fedora, thin arachnid arms stretching out from a hunchbacked torso. Sadakichi had done the drawing himself, and a friend described the self-portrait as looking like “a devil out on a furlough.” Another friend who knew him in this period described him as inhabiting the “warm shelters of mediocre people… He equated love fulfillment with oblivion and death… he made a joke out of life, drank a toast to death. Impressed by his wit, film people would invite him into their homes—the fading poet and critic lent an intellectual air to Brentwood cocktail parties. He was their mystical Asian, and played the role dutifully. Douglas Fairbanks had cast him in an uncredited role as the Mongol Prince’s court magician in his 1924 swashbuckler The Thief of Bagdad. For the part, Sadakichi requested only a $250 salary and a case of whiskey each week. As the war approached, the son of Mephistopheles and Madame Butterfly was hounded by the U.S. government for having two kinds of poison in his blood, and he retreated to the small shack he had built himself in Banning. He died in the fall of 1944, when the war in Europe was in its final push. It’s hard to know what happened to the resting place of his mother after she died; her husband and two sons left Japan forever. But what is known is that the summer after Sadakichi died, the “Fat Man” bomb was dropped over Nagasaki, atomizing the entire city, and with it any record of his mother’s brief life. And this is where Pinkerton ends and Sadakichi begins. His solid American wives were less real to him than this Japanese ghost. The truest love was for the memories he’d never had: the beautiful bay of Nagasaki, the wild chrysanthemum, the body of his mother traveling across an ancient landscape, unburied. There are no perfumes to recall a life unlived. The curtain lifts to reveal a teahouse on the cliff of a lake, the cloth brushes against the trees and blossoms fall to the ground, the first perfume of the evening. The guests waft in and out from the teahouse, many are served with tea, the second perfume of the evening. Night falls, the lanterns are lit and the dancing girls begin their song. As they dance, their robes are cast away, each a flower whose scent drifts through darkness. Filling the air is the one bouquet missing from his long-ago concert, the perfume of the seventeenth minute onward. To drink its tea, a white-fingered lady pours hot water over the entire blossom, which stretches and yawns until it fits snugly at the bottom of a porcelain teacup. In the steam, the scent of crushed chrysanthemums fills the air. Michelle Legro is an associate editor at Lapham’s Quarterly.